We have been undertaking Turnkey Projects Services or pipe turnkey projects for providing best available economic solutions to our clients. 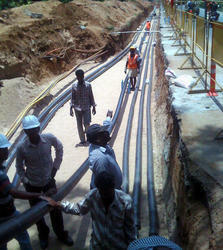 These pipe turnkey projects are offered and executed under the super visionary guidance of our team of experts. Ample industrial experience has led us in offering a wide range of Turnkey Projects Services (Pipe Joining Projects) for offering well planned solutions to the conveyance requirements of our esteemed customers. We have a team of experts who execute HDPE / MDPE / PP pipe line laying projects and also offer efficient after sales service to our clients. We undertake various Turnkey Projects for our clients that are specific to the welding and allied processes. Our skilled engineers and technicians first understand the requirements of our clients by conducting technical discussions and plan out the designs according to the specifications. As a part of the turnkey projects, we make proper selection of pipes, work on fabricating and laying them, and assist our clients in the commissioning and pressure testing of the entire pipe systems.